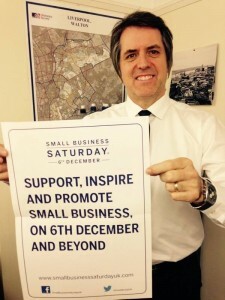 Steve Rotheram MP has joined Shadow Business Secretary Chuka Umunna MP in celebrating the contribution of small firms in Walton as part of this year’s Small Business Saturday on 6 December. Consumers are being encouraged to ‘shop small’ and celebrate the contribution of entrepreneurs and small firms this weekend. Last year, Britain’s first Small Business Saturday gave a boost to local shops through extra trade of nearly £500m of additional spending with small firms on the day. Across the UK different activities are taking place to promote Britain’s small businesses. In Liverpool there are special events planned for Small Business Saturday and Steve will be spending time on the high street in Walton. Labour has announced plans to cut – then freeze – business rates for small firms. Since 2010, small businesses have seen business rate hikes of £1,500 on average. Labour would also take tough action to tackle late payment to small firms and freeze their energy bills. The former Lord Mayor of Liverpool is backing local businesses to take advantage of the campaign on a key shopping day in the year in the run-up to Christmas and encouraging local people to shop locally in small firms as part of Small Business Saturday. The day aims to give a long-term boost to trade and give a lift to the high streets. Steve explained: “I am looking forward to backing our local small shops and independent businesses on Small Business Saturday. We should do all we can to thank them for the vital contribution they make to the local economy, adding to the local community and boosting diversity on the High Street. Shadow Business Secretary Chuka Umunna MP said: “Building on the success of last year, Small Business Saturday 2014 will be even bigger and better in Liverpool, helping to provide a much-needed boost to our High Streets and making even more consumers aware of the fantastic products and services offered by small and independent businesses.